Live oak is the main evergreen oak tree in the southeastern United States. These trees start out very small and soon grow upward and outward to achieve a size up to 80 feet tall and 100 feet wide. Because of this, it is easier to avoid damaging a live oak if it's transplanted while young and small. Live oak trees that have been in the ground for several years should be root pruned the year before being moved to help them develop new feeder roots that will see them through the shock of transplanting. Time root pruning and subsequent planting for late February while the tree is dormant to minimize transplanting shock. Measure the diameter of the live oak tree at waist height with a pair of calipers. Multiply the number of inches in the measurement by 9 inches to determine the diameter to prune around the tree. 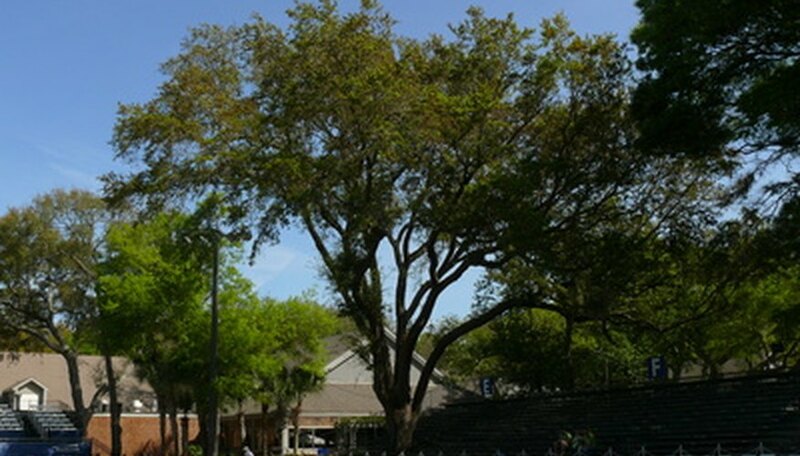 (A live oak with a 2-inch trunk should be root pruned in an 18-inch circle). Divide the rootball diameter by half. Insert a spade into the ground this distance from the trunk of the tree. (Prune a 36-inch rootball by inserting a space into the ground 18 inches from the trunk). Work the spade into the ground in a circle around the tree at this distance. Tilt the spade back to a 45-degree angle so that the tip points toward the tree. Shove the spade into the ground in such as way that it severs the roots as it enters the ground. Wait one year to lift the live oak tree from the ground. Insert a shovel into the ground at a point 6 inches beyond the root pruning circle you made the previous year. Continue to insert the shovel into the ground in a circle around the outside of the root pruning circle. Rock the shovel from side to side to loosen the rootball from the ground. Tilt the shovel back and lift the rootball from the ground. Select a location for the live oak that is well away from structures such as sidewalks, buildings or the foundation of your home. Dig a hole that is twice as wide and no deeper than the rootball of your live oak. Set the rootball in the hole and fill in around the roots with soil. Live oaks should never be placed in a location that they will outgrow or near structures that their roots will disrupt.